Charles was a local lad, born on December 22nd 1896 to Alfred and Emily. He had at least two brothers and was probably the eldest. The family was well known in Eton Wick where his father had a small building business and for many years was also the village undertaker. Later on, during the 1930s, undertakers were increasingly expected to have proper premises, limousines instead of hand pushed biers and later still, even a chapel of rest. Alf's income increasingly depended on the building work. Charles early years were spent living at Bonacord Cottages, on the Eton Wick Road: these are the four houses situated between Clyde Place and Ada Cottage. The family later moved to 24 The Walk and lived in the first terraced house on the right. Charles attended the village infant school until the age of seven when he went to Eton Porny. In 1910, when he was 14 years old, he left school; the reason given in the register stated: "to be a milk boy". This we can presume meant working for one of the village farmers: there were at least six, and all delivered their milk to the Eton College and village homes. It was, of course, all ladled from churns at that time. Charles Miles of 24 The Walk, Eton Wick, 1st Class Stoker on H.M.S. Vanguard lost at sea on July 9th 1917, age 20 years. Throughout the early summer months of 1917 British shipping losses had been quite severe. On May 27th the hospital ship, Windsor Castle, had been sunk, with 600 wounded troops on board. Fortunately, they were rescued. 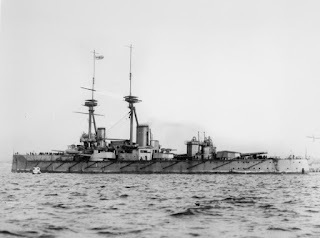 Then six weeks later on July 9th the Royal Navy suffered a terrible calamity when the Dreadnought Class battleship H.M.S. Vanguard was lost. The great ship was lying at anchor with the fleet at Scapa Flow when without any warning, she blew up. Her entire crew of 804 officers and men were drowned when the ship sank. The mysterious internal explosion which sank the Vanguard was very similar to the loss of another battleship, H.M.S. Bulwark, and also of the cruiser Natal. The Vanguard, on which Charles served, displaced 19,250 tons and carried ten twelve inch guns in her armament. Several young men of Eton Wick chose to serve in the Royal Navy, and Charles was one of the village's two naval fatalities. Most sailors have unmarked graves and of the 20,000 who died in the Great War no less than 18,600 are without marked burial places. After the war, memorials were erected to commemorate these men. Charles Miles is commemorated on the Chatham Naval Memorial in Kent. The names of 8,515 sailors are cast on bronze panels placed on the buttresses of the memorial. Buttresses support the four corners of the tall stone tower, each with a lion couchant. Toward the top the tower branches out into the form of four ships' prows. The memorial overlooks the town of Chatham and can be approached by a path from the town hall gardens. Charles was single and 20 years of age. Many years later his brothers built fine houses in many parts of the village, including Cornwall Close and the west end of Queens Road. We can but speculate whether Charles, had he survived the war, would have worked in the family business. He is commemorated on the Eton Wick Memorial and on the Eton Church Memorial Gates. Charles Miles: The Commonwealth War Graves Commission page. Charles Miles: The For King & Country page. Charles Miles Lives of the First World War website at this time. Further information now available about the Miles family. The 1911 census reveals that Alfred and Emily Miles had six children of which Charles was the eldest. The family are recorded as living at 24, Clifton Cottages.